← Back to Utah & A Big Thank You To Wilson Electronics! As a kid, the only computer game I ever played was the Oregon Trail. I loved that game. I usually chose to be a doctor, so my wagon train had fewer fatal illnesses, but we often died from hunger since, as a real life vegetarian, I refused to hunt for food, on what I thought were principles. Now when I travel out West, names like Laramie and Inscription Rock sound familiar, thanks to the Oregon Trail game. In Wyoming, I stopped to visit an actual section of the Oregon Trail and for the first time, began to grasp just how many wagon trains made their way West on this route: ruts from the wagon wheels are worn deep into sheer rock! 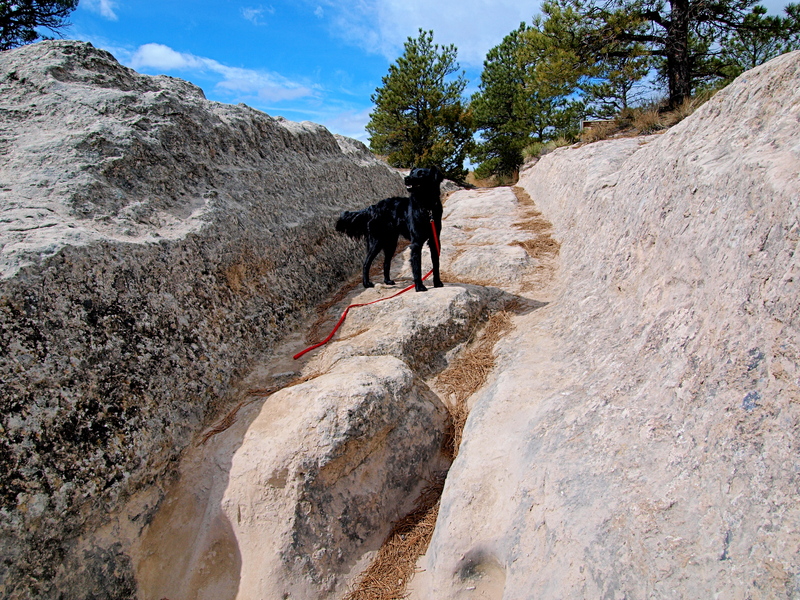 Wagon wheel ruts weren’t the only marks the Pioneers left here in rock. 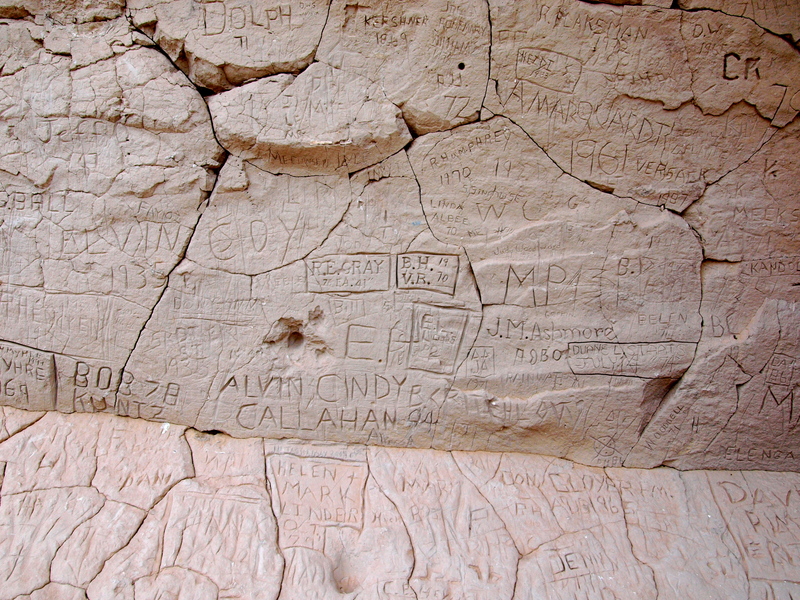 Hundreds of travelers also left their names, initials and inscriptions, carved in soft sandstone. 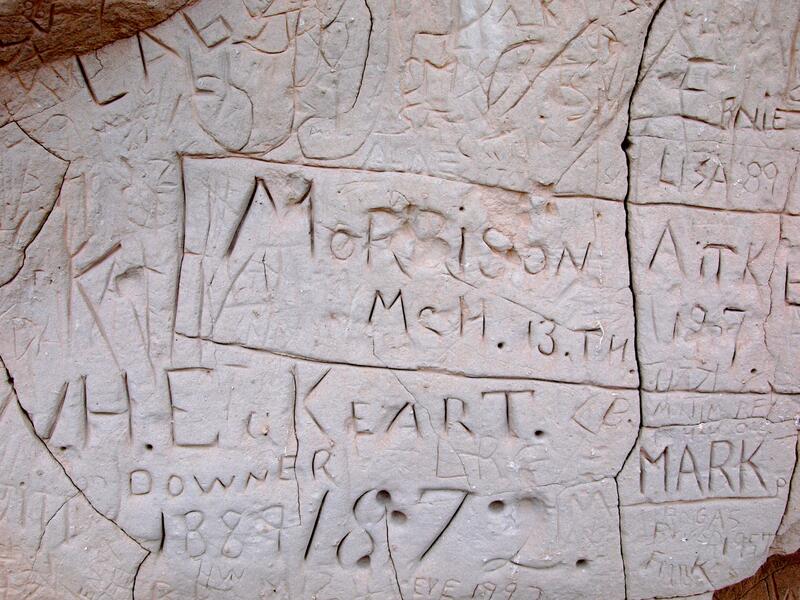 Some carvings are more recent (1961) while others are more historic (1872/ 1889). After the Pioneers came the Pony Express, orphan boys riding half-broke mustangs 1,900 miles across the Great Plains, the Rocky Mountains and the High Sierras, delivering mail from Saint Joseph, Missouri to Sacramento, California. 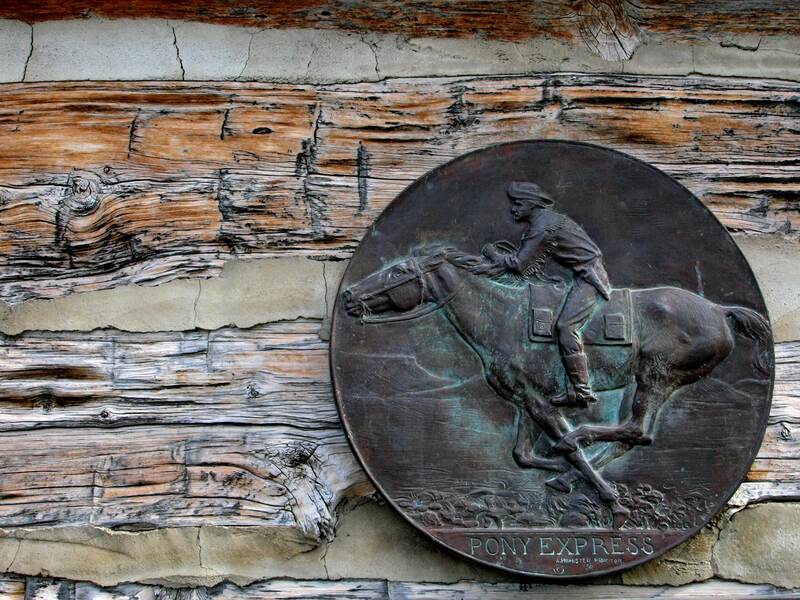 These rough riders hold an iconic place in western lore, but the Pony Express only ran for 18 months, from April 1860 until October 1861, until the first telegraph wires were strung across the country. Today, a series of bronze monuments trace the original mail route across the west. I used to say I was born a century too late; I would have loved to have been a Pioneer on the Oregon Trail. Now, I’m quite happy to have been born in the early 1980’s. The Pioneers had one hell of an adventure, but I’m more than happy to be crossing the West with the Raven & the Rattler. Amazing. My direct ancestor Jackson and a bunch of his family settled in Oregon via the Oregon Trail in the early days of settlement. I would’ve been on the trail too. you post some really fascinating stuff Mary- thanks. I would have been too much of a coward to attempt that sort of journey- those wagon tracks- amazing. We have the wildfire smoke in the Albuquerque area again this year. That fire near Reserve is obliterating our views and air quality. Enjoy your travels! The opening line…As a kid, the only computer game I ever played was the Oregon Trail…. When I was a kid there were no such things as computer games…we played outdoors, and yes Cowboys and Indians was one of them. On a family road trip to Yellowstone …circa 1967 or so we made an outline of a “covered wagon” using grass clipping at some rest area in South Dakota…a picnic lunch break long before the era of fast food. The sad thing is that I played it in school! Like it was some kind of educational game or something. At home, we weren’t allowed in the house unless it was absolutely pouring down rain. Sometimes then we played in the puddles. Where in the Wild West do you live? As always a fantastic post. You capture the Origon Trail and make it sound so exciting.Thanks for sharing those wonderful pictures. 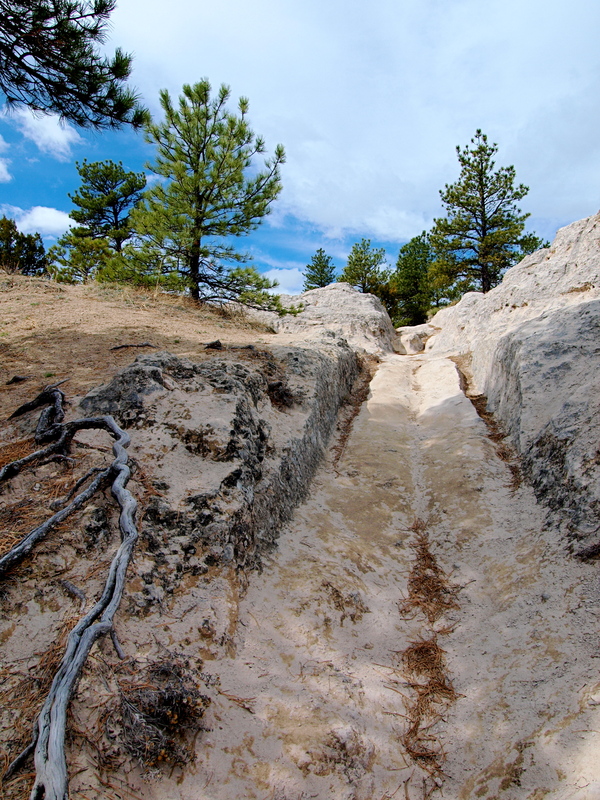 Your photo of the Trail Ruts in Wyoming is one of the best I’ve seen including those I’ve taken. I’ve been fortunate to follow the Trail from Missouri to Oregon.